When size matters: What’s on your plate? I spent last weekend in New York visiting my sister Loreen. To make this trip I usually drive or fly from Toronto to New York City (NYC), but this time my parents and I drove across the border to Buffalo, then took the train to NYC’s Penn Station, and a train to Huntington on Long Island where Loreen picked us up to drive the short distance to her home. 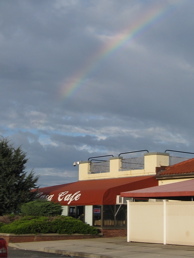 A rainbow appears over La Casa Cafe on Crab Meadow Beach in Fort Salonga, Long Island, New York. While the restaurant’s interior is somewhat dated, if you get a seat at a table by the wall of windows, the view of the beach and Long Island Sound will easily distract you from any decor issues you might have. You can see some images of the area surrounding the restaurant by clicking on La Casa Cafe above. I snapped the image to the left mostly to get a picture of the rainbow although I should probably have been concentrating on getting a good picture of the restaurant. In addition to Loreen’s birthday we were celebrating the end of a couple days of rain! A heaping serving of lasagna for the birthday girl! The generous portion could feed 2 to 3 people. The menu is Italian and the portions are huge. You will not go home hungry! The four of us each left with at least half of our meal wrapped up and ready to reheat and enjoy again the next day. Restaurant portions have been increasing in size for some time. Just think of the mammoth muffins served with uber-sized cups of coffee, the seemingly bottomless portions of soft drinks fast food restaurants offer up, and the mountains of french fries that often accompany burgers and sandwiches. Of course, in the long run, excessive portions mean more calories and fat in your diet than you need. This can lead to serious weight gain and health problems. If you’ve wondered about serving sizes and just how much food should really be on your plate, consider the advice about portion sizes recently offered by dietitian Leslie Beck. To avoid ‘portion distortion’, keep these visuals in mind when you sit down to eat.